Thomas L. McLaughlin began his career on Wall Street as a leveraged finance investment banker at Bank of America Merrill Lynch, where he was responsible for advising corporations on capital raising, debt restructuring and leveraged buyouts. Continuing his career as a restructuring investment banker at Alvarez & Marsal, Tom worked with corporate clients and creditor committees involved in special situations, bankruptcy and M&A transactions. 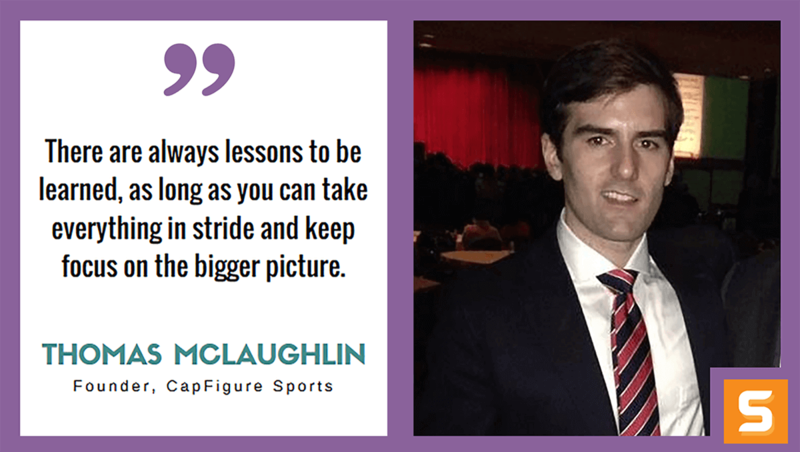 Combining the skill-set and perspectives acquired during his time in the investment banking industry with his lifelong passion, Tom founded CapFigure Sports in 2015. The sports-media enterprise provides unbiased analysis of the crucial decision-making, analytical and economic trends within the major sports world. Tom has gained notoriety within the American sports industry. An active member of the Society of American Baseball Research (SABR) and Football Writers Association of America (FWAA). In this interview with Startup Savant, Thomas shares his entrepreneurial journey as an investment banker and sports fan. We get a close-up look at how he combined these two passions to start a dream business. Surround yourself with people who are completely honest with you. Don’t lose sight of the big picture. Whatever your goal, nothing worthwhile is accomplished overnight. What motivated you to start CapFigure Sports? How did the idea come about? There was an amazing shift of perspective that took place in my life between the ages of 21 and 26. Moving to New York with a degree from a prestigious college and a “dream job” at one of the premier investment banks, I was 100% confident that my life would fall into place and that I was on the fast track to success. The problem was that I had not been true to who I was as an individual, I was living someone else’s definition of success. When I was a young boy I had a reading disability, so while your average five year old was reading Dr. Seuss, there I was memorizing the back of baseball cards. Sports has always been the driving passion in my life, I never lost sight of that obsession. After a few years of training as an investment banker, it became clear to me that my experiences and skills in the financial sector were totally applicable to the sports industry. Still to this day, I apologize to my friends because I would send these multiple page rants about salary cap implications whenever a team would overpay a free-agent athlete. That was where it all really came to light though. Through the encouragement and support of those very friends, I began believing in my abilities and took that initial step toward what is now known as CapFigure Sports. Taking risks, which isn’t intuitive for someone as calculated and analytically minded as myself. The idea of leaving a job on Wall Street to start writing about sports would make me laugh as a 21 year old. The problem was I was looking at the risk from the wrong perspective. The real question was, what do I have to lose? And when I can look at any situation or challenge from that angle, I’m generally much more apt to follow my heart. My grandfather has always been nothing short of an exceptional role model for me. As a young man living in Post-WWII Germany, my grandpa boarded a ship and sought after a better life in the United States. Limited English and only a few dollars in his pocket, it was only a few months that he was in the country before being drafted and sent off to fight in the Korean War. That mindset of turning obstacles into opportunities, now that’s what I want to become. So much of sports media coverage is completely watered down and biased because of affiliations with league ownership, agents and the like. We take a completely unbiased stance and enjoy digging deep into some of the more intricate topics influencing the sports industry today. Gone are the days of professional sports being a purely entertainment industry. The best executives in today’s professional sports organizations incorporate strategies and processes from Fortune 500 companies and Wall Street into developing a championship level organization. We are committed to telling those narratives and bringing the true sports fanatics this type of information. I’ve had quite a few trolls come my way on Twitter. I always try to take my personal emotion out of the situation. There are always lessons to be learned, as long as you can take everything in stride and keep focus on the bigger picture. Absolutely. Every step of this journey has been challenging and there were numerous times when I wanted to pull the plug and go back to the finance industry. Managing time and resource constraints has also been an ongoing challenge, one that I don’t think will ever change. Every night before I go to bed, I like to review my schedule for the next day and write down a few goals for the next day. When I wake up, I try to eat and do some sort of physical activity before jumping into work, which I find clears my head of all of the static and allows me to be totally present and in tune with accomplishing those goals outlined the night before. Another trick I’ve found helpful is reading about an hour per day. I’ve always got a book and a few articles to edit in my backpack, and I use the time that I’m on the subway to get this done. It may not make a big impact doing this once but if I do this once, seven times a week for 52 weeks, the benefits are astonishing. It wouldn’t be any one thing in particular. Today I’m in a place where I am surrounded by incredibly inspirational, supportive and honest people. That is a truly powerful force when things are down. Another crucial pillar would be the habit I’ve gotten into of reading books on philosophy and spirituality. For the most part, I’ve tried to develop a long-term perspective in all areas in my life. So when I wake up late to frantic e-mails on a rainy day, I can look at myself in the mirror and know that this is a challenge that will serve a bigger purpose and a few years from now I’ll never look back and cherish that memory of staying in bed that morning. Who has been your greatest influencer along your entrepreneurial journey? How did they shape CapFigure Sports? Ryan Holiday. His book 'The Obstacle Is The Way' had such a profound impact on the way I viewed relationships, business and happiness. As someone who was completely skeptical of reading a philosophy book, I can tell you that taking the suggestion and reading that book was one of the turning points in my life. Is there a type of marketing that has worked amazingly for CapFigure Sports? If so, how did you stumble upon it? As someone with literally zero marketing experience prior to this venture, I cannot speak enough to the power of Social Media platforms. In fact, I hadn’t been on Facebook in years and never owned a Twitter, Instagram, etc. When I began publishing material, it became increasingly apparent that I would get nowhere without a proper syndication strategy. I must have spent a full month of long nights setting up each of the platforms, connecting them and aesthetically building out the full platform we have today. It’s astonishing to me to look back at where we were only a few months ago and see the huge steps forward we’ve taken. Although financially our business is not thriving at the moment, the platform we’ve built have opened numerous other opportunities. In five years, I’d like the company to be able to support the salary of a few employees, giving young sports journalists a place to realize their dreams. What are the three best pieces of advice that you would give to anyone starting a business in New York? What do they need to know from the very beginning? Whatever your goal, nothing worthwhile is accomplished overnight. In order to develop something meaningful, you need to develop a process by which you can do meaningful things each and every day. For updates on the latest sports news and analysis, follow Thomas on Twitter and listen to his podcasts at Capfigure.com!